The chairman of the Scottish Police Federation says more must be done to keep underage gamers from playing 18-rated games. In April, a 13-year-old boy attacked a 14-year-old acquaintance in the town of Clydebank, Scotland, slashing his throat deeply enough to expose his windpipe and causing a wound that required surgery and 20 staples to close. As if that wasn't bad enough, the boy apparently told his victim, "Don't die," before "calmly walking off." 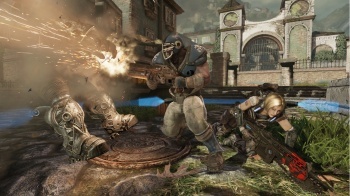 The pair first ran into each other online around Christmas 2011 while playing Gears of War 3 and then met in real life sometime after that; about a month prior to the attack they apparently had a falling-out, "amounting to name-calling via the messaging system used in the game," according to Andrew Brown, the prosecutor in the case. Unfortunately, the roots of their connection and conflict have police once again blaming games for causing violence. "The reporting officer was of the opinion that the violent videogames played online by the accused may have been a factor in his conduct," Brown told the court. Brian Docherty, the chairman of the Scottish Police Federation, also weighed in, saying, "These games are rated 18 and shouldn't be played by children of this young age - but online gaming may be outside their parents' knowledge. We need to look again at what we can do to stop this." A Microsoft rep expressed sympathy for the victim and his family but pointed out that the Xbox 360 is already designed to limit access to inappropriate content. "We have some of the most robust parental control systems to empower parents to decide how their children play and communicate," the rep said. But that system is obviously dependent upon parental input and monitoring, which Docherty doesn't seem to think is an effective approach to take. The Daily Mail also noted that the 13-year-old assailant has a child of his own, the implications of which I will leave you to discuss amongst yourselves.